"I'll jump it for you"
it was always the same with the jumps. 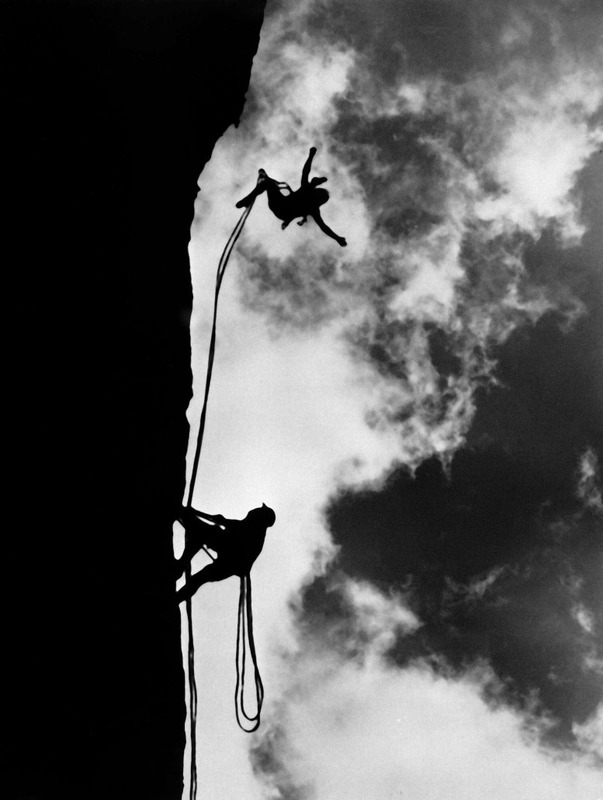 i said: ”hey, would you jump that?” ”Okay, i’ii jump it… but only once.” photographer KAREl VLCEK remembers, how he had manipulated climbers. He runs, pushes off and flies. 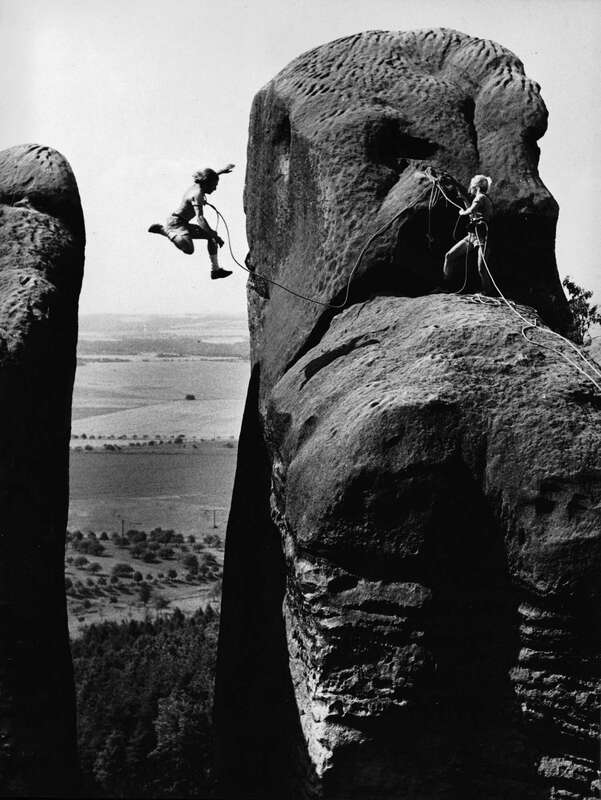 For a moment he waves in a position that does not resemble any climbing position at all. His hands catch a hold on the other tower. And then his feet quickly hit the wall like a pendulum. 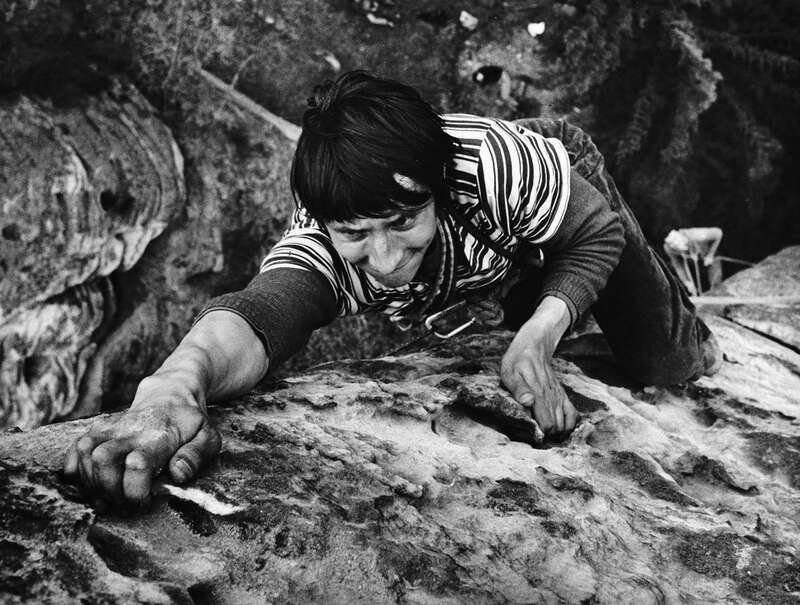 “He detached one of his his toe nails and was in such pain that he lost his hand grip,“ Karel Vlcek describes one of the hardest jumps ever made on Czech sandstone. In addition to that, the belayer did not give enough slack, so on the next pendulum swing the climber hits his head against the tower he had jumped from. 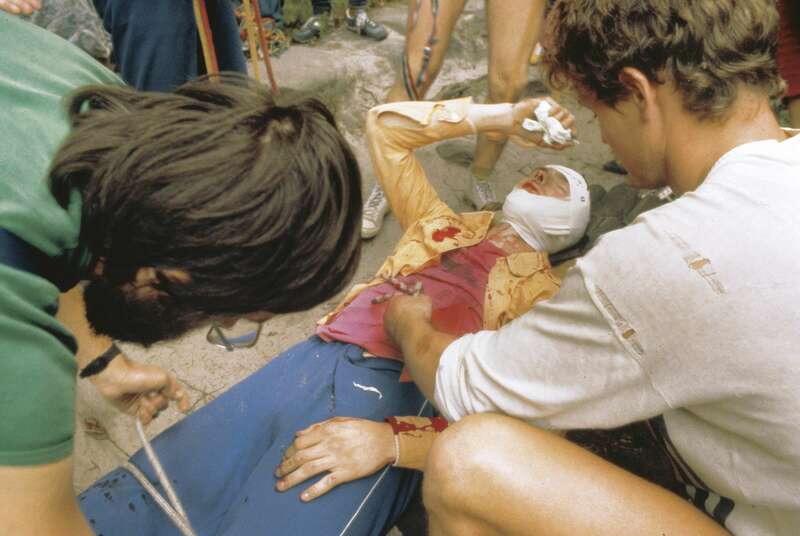 In a minute, there is a crowd all around the bleeding boy and the photographer keeps working. 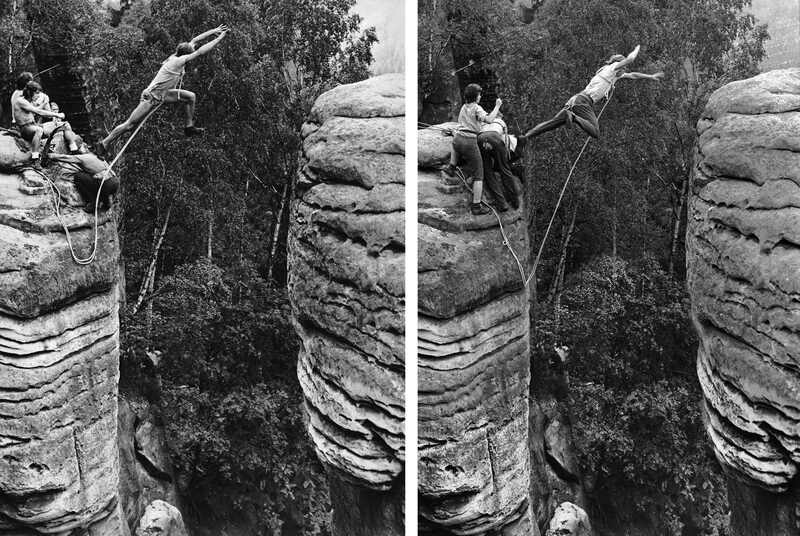 Karel Vlcek took pictures of sandstone climbers and jumpers from the 60’s to the year 1990. “I was a big manipulator. When I wanted a particular shot I got it,” he says in his basement photo studio in Prague where he printed all of his pictures. 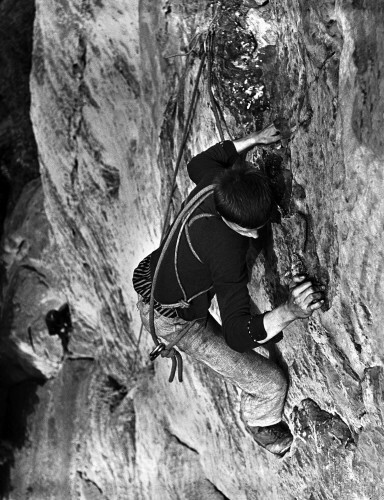 Sometimes he forced climbers to jump many times for one shot. For example he made Tomas Cada jump from Milenec to Milenka in Adrspach eight times. Copying photos was expensive, that’s the why Karel needed to take eight original diapositives. Then he used some for himself and some for publishing. He sent a lot of pictures to Western magazines from the former communist country. Were you shooting real situations or was it all arranged according to your vision? Nothing is “real”. We had discussed all of it before. 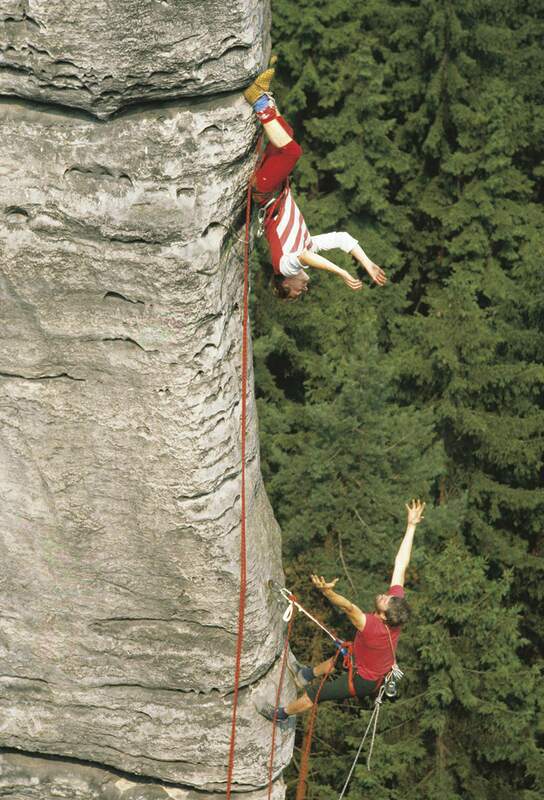 We usually agreed on most of the jumps, for example with Joscik Hradecky who was an extreme climber of that time. I told him: “Hey, I need one shot of a jump onto Janebovka tower.” “Well, let’s go to Janebovka.” He emigrated after few years and died in Switzerland in an accident. 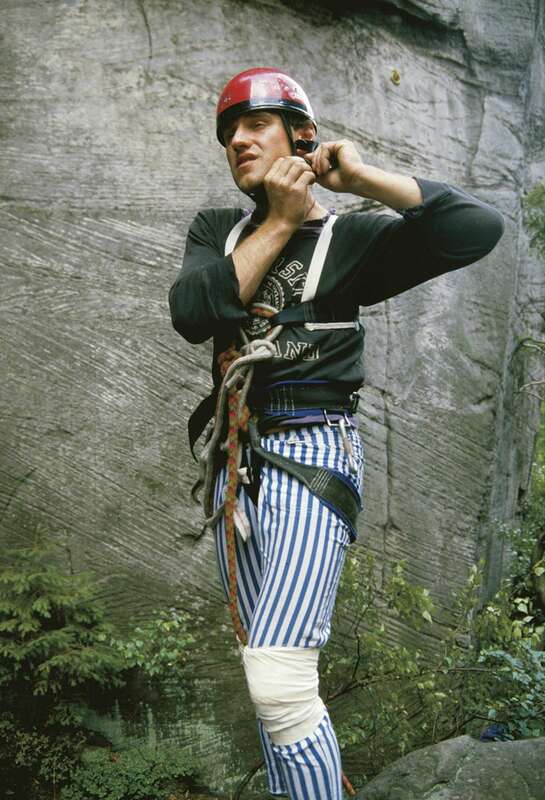 In his best years, he‘d soloed the famous Kapelnik tower from the valley (VIIIb sandstone, 6b, 60 m of fragile vertical wall, editors note). On this route I made my first picture from a hanging position. 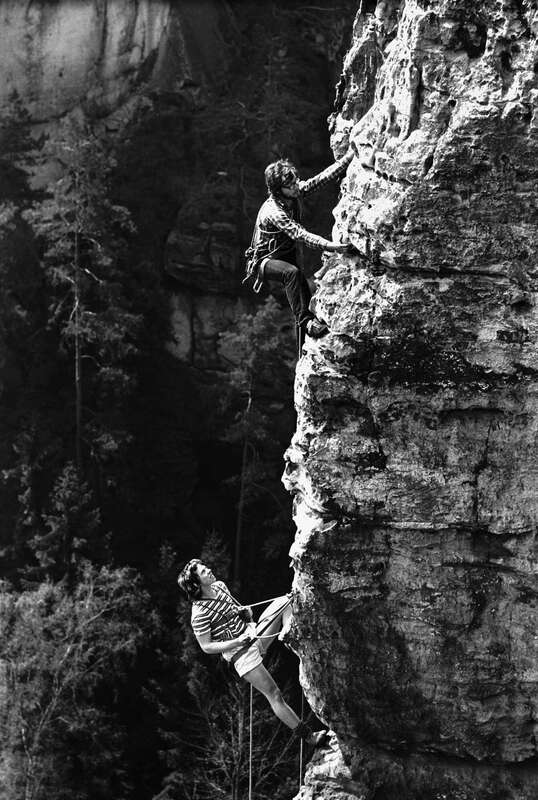 It was in the year 1969, Ota Novak climbed the route for me. So, you usually think of something and then send someone to climb it? Yes, for example in the High Tatras I was walking on a path where I met my friend “Spider”. So I told him: “Good to see you! Take a piton and hammer it into this boulder!” You see, I took this picture from the path while Spider was hanging just two meters above the ground. That´s how I shot the picture below. 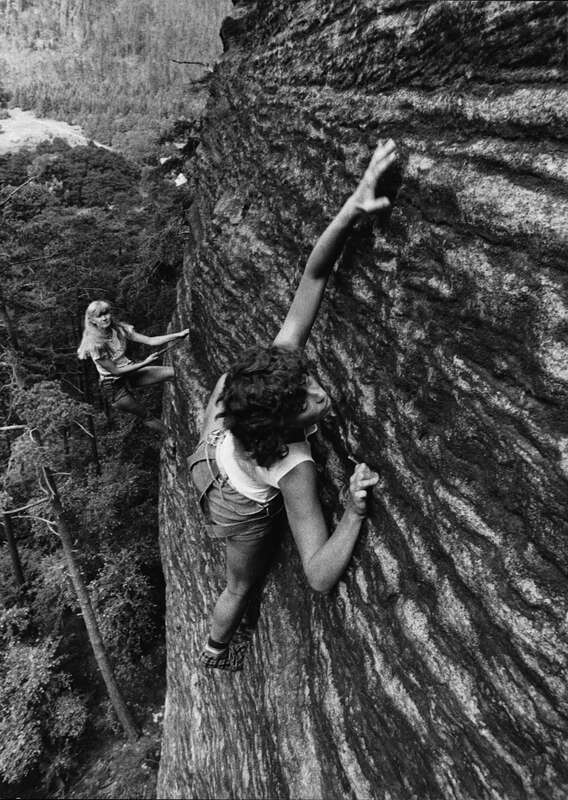 What did you start first – climbing or taking pictures? I started climbing first. They took me to Skalák in the north of the Czech Republic to climb on the tower Blatnik. 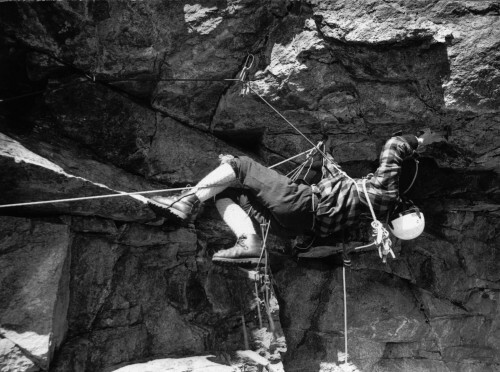 I started on the sharp end, they gave me a girl to belay. Then they told me: “You’ve done Blatnik, now climb Podmokly.“ They gave gloves to that girl because they thought I would fall. Two weeks later I decided to lead Kourovka route (VIIb, 6a). I fell from just under the first bolt. Down on the ground I told myself: “No, I’m gonna move to the safe end of the rope.” I did not lead routes any more, the safer end is always good, especially when you take photos. When we talked, Pavol told me that they had usually been high on the meth. I was really surprised. He told me that they had not cared. They just took meth and then did not even rope up. Pavol made the first winter traverse of the main Tatran ridge. Did you go with him? No, I was just a member of the support group but I didn´t take many pictures at that time. The Spiders were really tough guys, they resisted so much. In their sleeping bags there were three liters of water. Especially Pavol was tough. Those are not so difficult, they were shot with a wide angle lens so the land seems steeper than it is. But Jana Hilbertova in the picture climbed very well then. 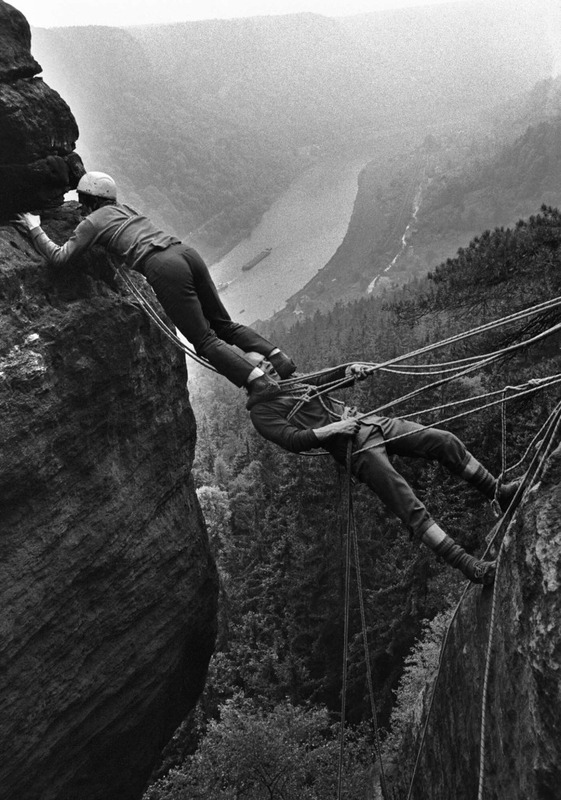 She did the Czech version of Separate Reality, an overhanging crack in Ostrov. (VIIIc, 6b+). What about this picture of a twin crack? The rope is hidden somewhere inside, I guess. How did the typical jump shooting go? With the jumps it was the same every time. I asked: “Will you jump it for me? 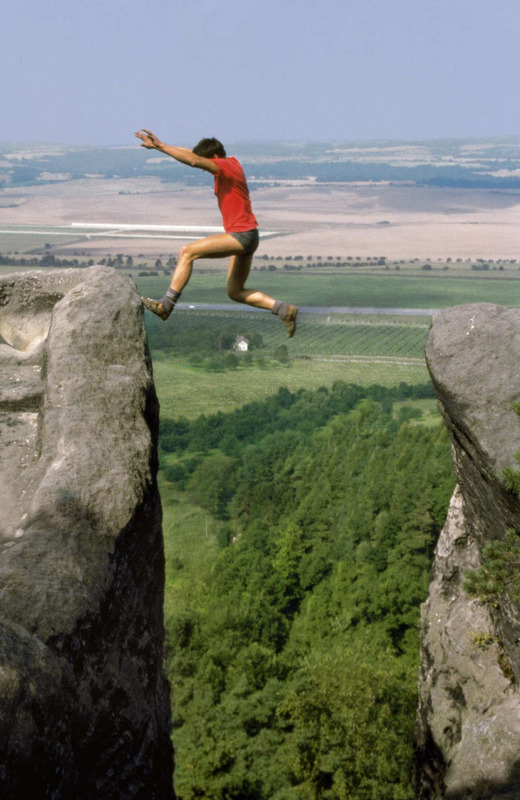 And they said: “Okay… I’ll jump it for you. But only once.” And really, they were right – the second time they usually hobbled on the way home or I had to take them to the nearest hospital. I have made some short videos of the jumps as well, for example Petr Mocek on the Palcát tower, which was used in the American movie “Jump!”. How were Czech jumps considered abroad? 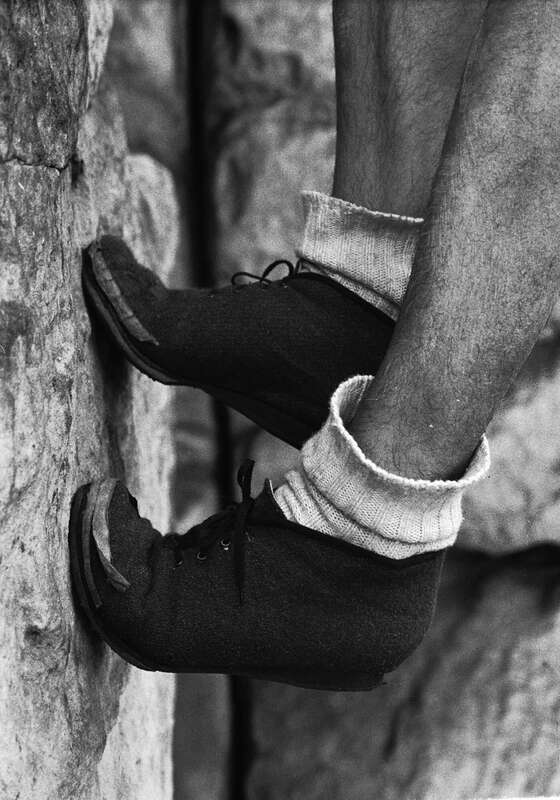 In the 80´s I had an exhibition in the French town Antibes, I met the best climbers of that time there, really the strongest guys. So I showed them the pictures and asked: “Would you jump it?” “Not at all! It’s terrible, insane!” Sandstone had a very resounding name at that time. 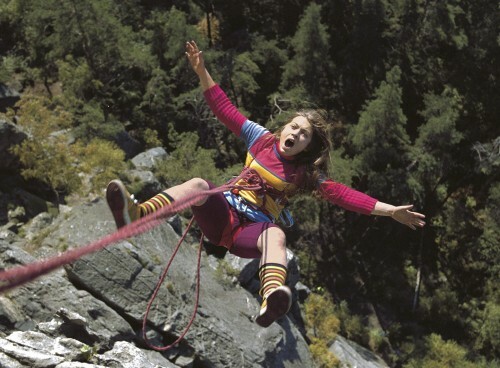 Did you jump using dynamic ropes? Mine, of course. I have always been a big manipulator. When I wanted something to be shot I achieved that. But Prášková was really tremulous after that jump. You could see her shaking… I forced her to jump four times because I wanted to have a photo of a girl falling where you would see her long hair waving up. So I told her: “Before you go climbing use a lot of shampoo, wash your hair perfectly and then let it down.” Unfortunately, I did not make the shot according to my visual imagination. The hair was still around her shoulders. Who did you like shooting best? Where did you travel together? 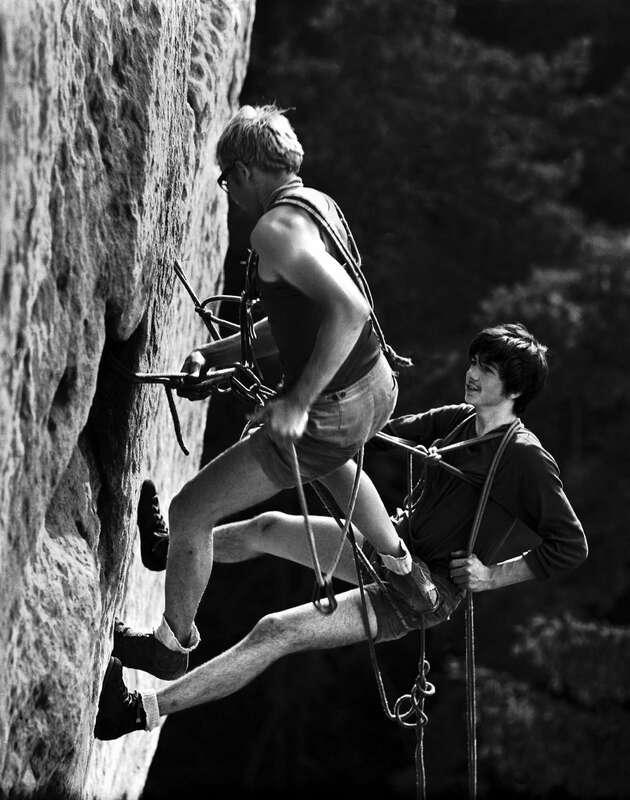 We spent a week together in Labak (famous Czech crag, editor’s note), but I cannot find those pictures. (laughing) He wanted pictures for himself and I made some for myself. I published them in the German magazine Bergsteiger, I was quite well known there. One day, when we were in Labak, the legendary Bernd Arnold came over and made a suggestion to me: “Hey, come join me for a week to take photos.” I refused. 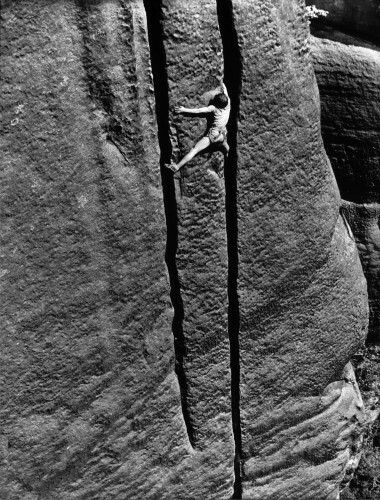 Maybe I should regret it because he is still an outstanding icon of sandstone climbing. But Hudy was much better than Arnold at that time. 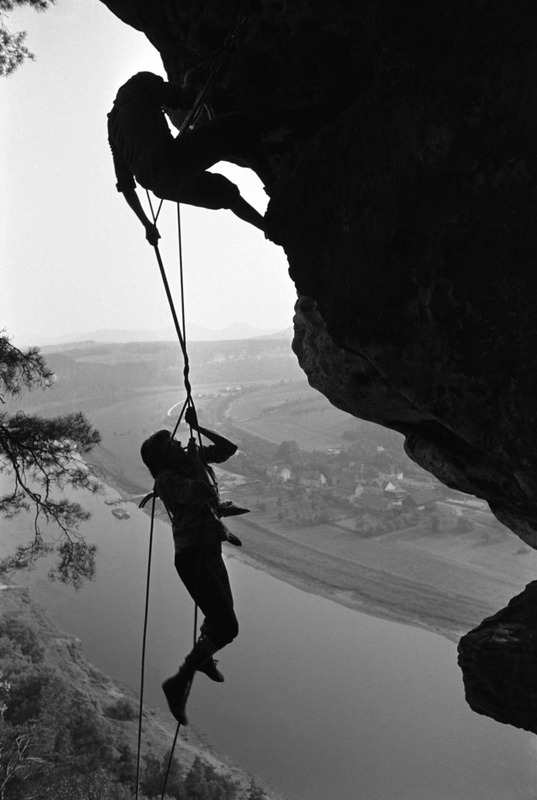 For example in one of the boldest routes which was a little moist that day, he was shouting, “Tell me where I should climb, I can go there, I can pose for you…” I have a nice story with him from Ruzova tower. I needed a picture from that tower so I told him: “Come on, hang for me on the wall for one shot.” So he climbed to one third of the wall. Then he shouted: “Well I’m already here I might as well go to the top!” And really, he put in two bolts and it was done in an hour. He didn‘t stop to relax and climbed extremely fast. 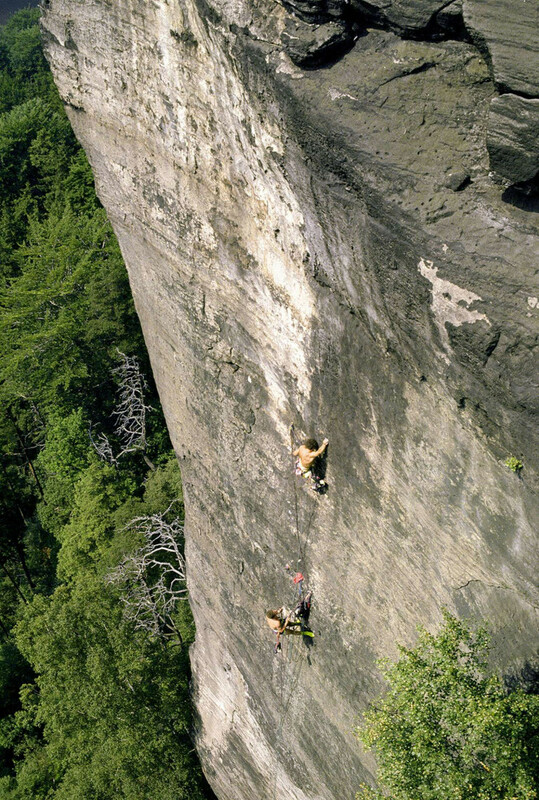 Nobody dared to climb that face before and Hudy did it so fast, saying, “I will not tell anyone about the route. They wouldn’t believe me anyway.” He reported the route several years after the first ascent, it is called Bílá Oblaka (Xb, 7c+). What about the picture bellow? I think it’s my best picture. I have never seen a back like this. We went to Labak and saw a stone quarry, I asked Jindra Hudecek: “Would you hold there?” He told me: “Yes, but just for a few seconds.” I shot that in bad light conditions, the shutter speed was something around 1/15 s. Luckily, the picture is not shaken. It was good. He was a good jumper and he didn’t dare to be angry with me. When we arranged something, he really climbed or jumped that. 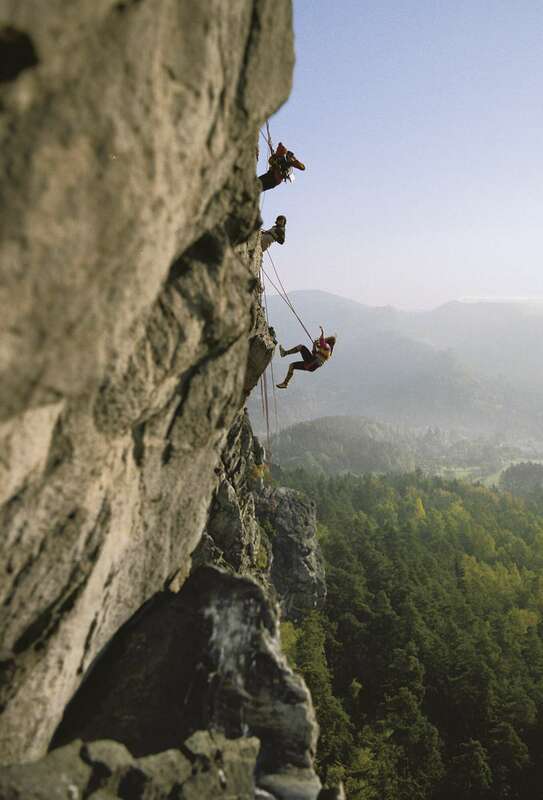 He is an extreme climber from Adrspach. 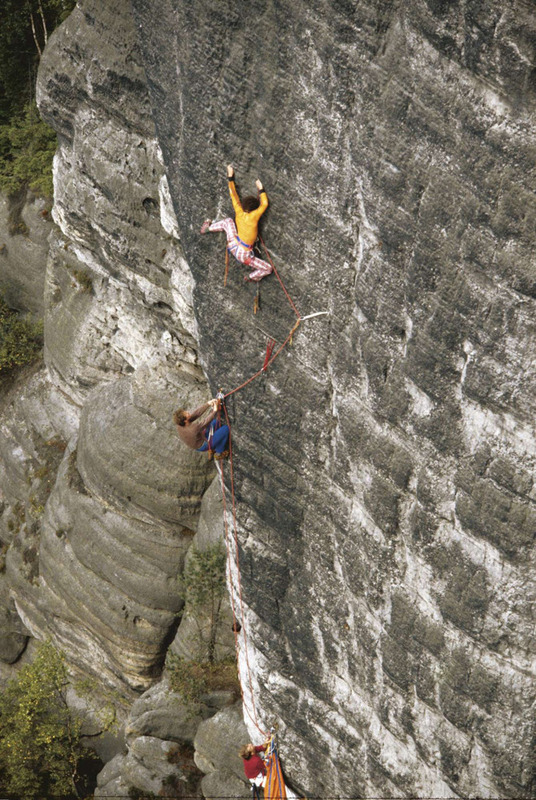 A crack-lover who can climb forty meters solo and then place a bolt. I remember him when he was starting, even then he was very good on cracks. 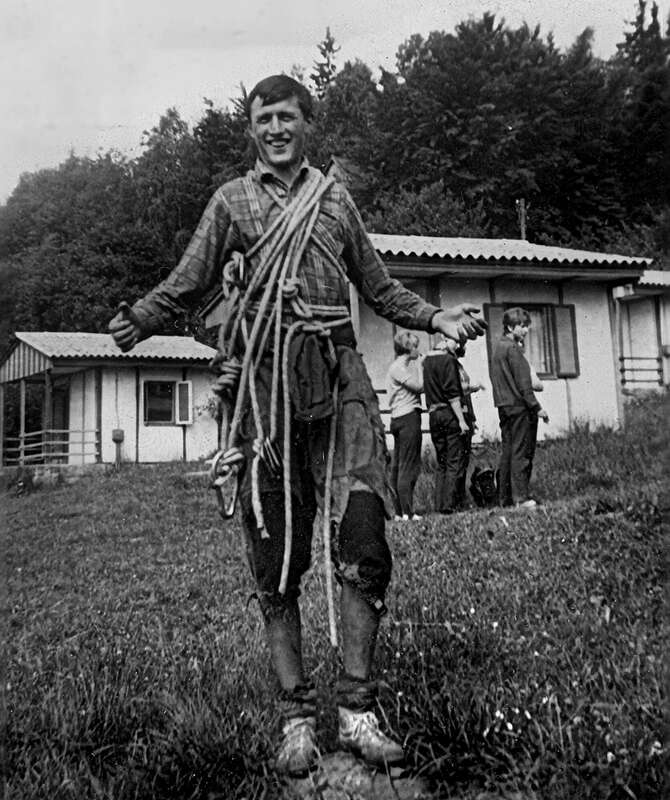 Jan “Chroust” Procházka was a great climber. 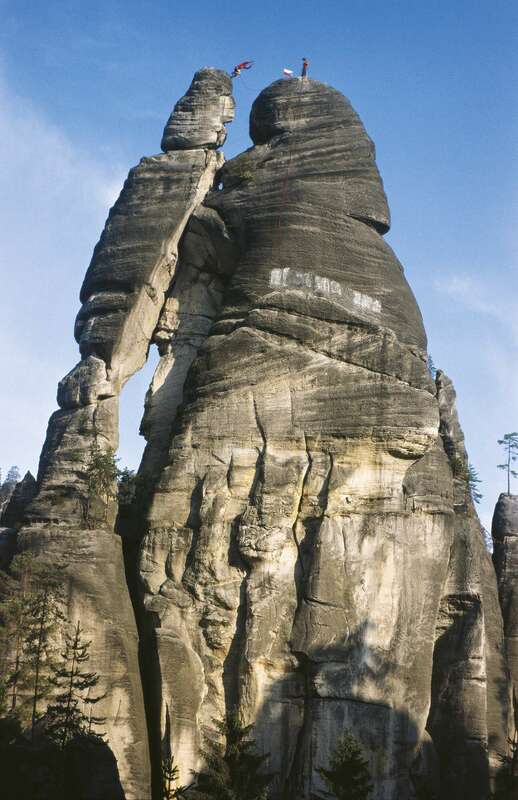 He free soloed Kapelnik tower ropeless, up and down. He was intelligent and mentally strong. I lived with him in Prague and I can still remember his positive thinking. 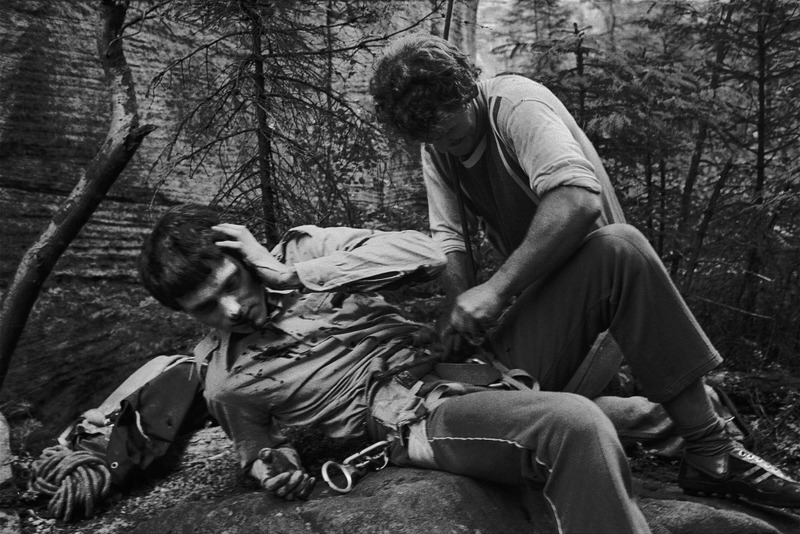 In 1969, one year after the country´s occupation by Russia, he went protesting and the secret police started to hunt him. He said, “I got into a narrow dead end and there was just a wall in front of me. So they beat me up.” He was kicked out of the university so he trained to be a bricklayer. But he enjoyed the work, he enjoyed every minute of his life. 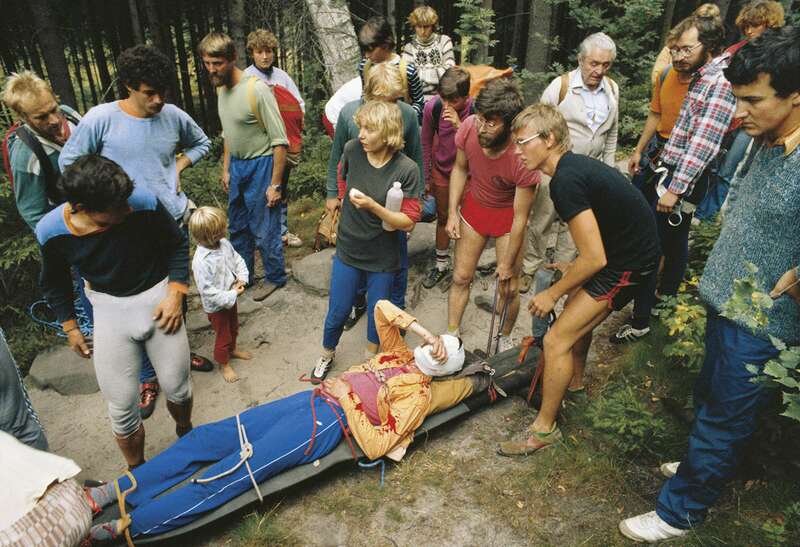 Chroust died in a mountain accident in Norway four years later… One person slipped and pulled the whole rope team to the valley. Can you describe the insane jump onto the Polar Throne? Karel Simek was the jumper, he did the first jump from the top of Herynek onto the tower Polar Throne. That must have been crazy! When you stand on the tower and imagine the jump… By the way, I found that multiple-exposed photo a few months ago. I forgot that I’d shot it. I wrote to Simek and asked him what that was. 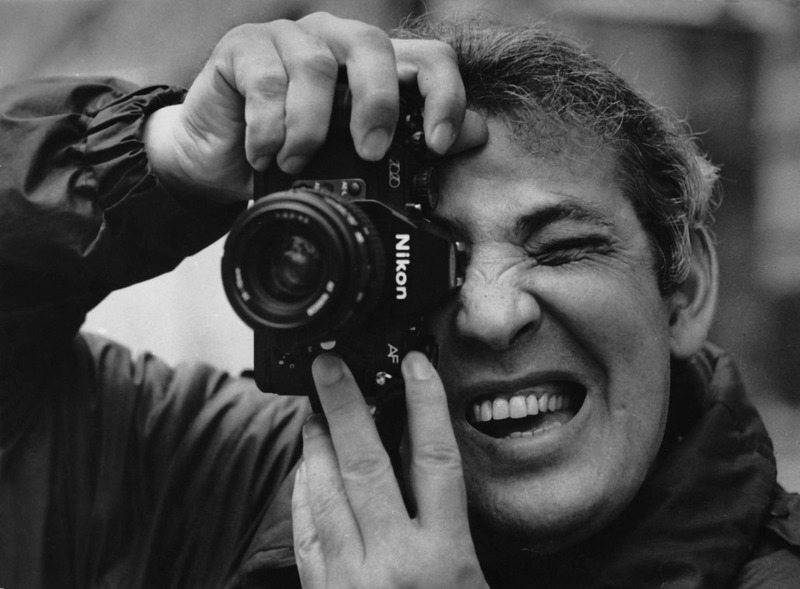 He answered that it was really my picture and that I was shooting him in 1987. That was the second time he jumped it for me. He did not stay on the hold but he did not get injured. And what about the injured man? What I found interesting… You did not stop taking pictures when he was lying in blood. Of course, I would have missed the action. One of the local climbers, Standa Silhan, was angry with me because of that. He was annoyed that I was shooting the rescue. I couldn’t let it be. Standa thought that I had forced the youth to jump but that was not true in this case. But he was right in general when he told me. 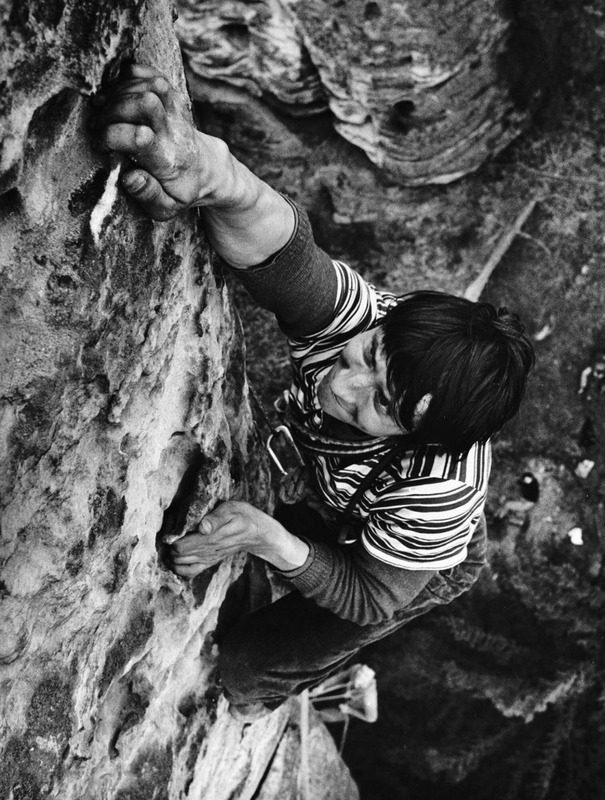 “When you go to the crag all the climbers ruin themselves”. Special thanks to Tendon Ropes for their help with English translations. He was born on the 25th April 1945 in Kateřinice, currently living in Prague, the Czech Republic. His nick was „Grey Wolf” or “the Grey one”. He gained a doctor’s degree on the Faculty of Journalism, Charles University, Prague. 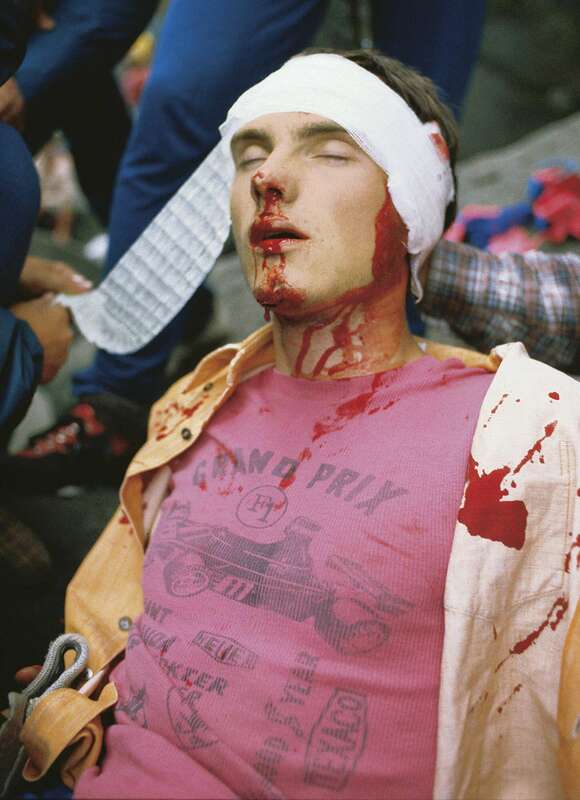 After the Velvet revolution he stopped working as a professional photographer and started running his own DTP studio. Every year he goes to a long bicycle journey, he’s cycled from the Czech Republic to Beijing for example.